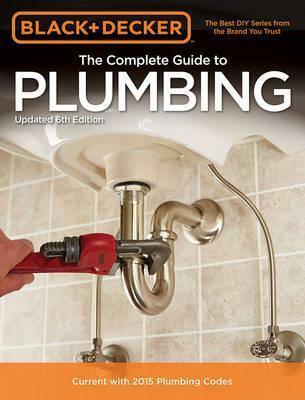 You might not have to call a plumber; get the most comprehensive, up-to-date book on home plumbing for DIYers of all skill levels instead! From fixing a faucet to installing a drain line in a basement floor, The Black & Decker Complete Guide to Plumbing 6th edition has the answer to any home plumbing problem you're likely to have. Packed with clear color photos and easy-to-understand descriptions, the basics of home plumbing systems are clearly explained, and all of the most popular plumbing projects are shown with beautiful step-by-step photos. This new edition has been thoroughly updated to ensure that all information conforms to the most recent codes, including the 2015 Uniform Plumbing Code and the 2014 International Residential Code. New projects include plumbing and tiling a curbless shower. Other features include projects to promote accessibility in the bathroom; updated bathroom ventilation featuring new products; and an expanded section on exterior plumbing, including pools, pumps, and sprinkler systems.